The Janus Affair: A Sneak Peek and a Balticon Bash! Well, here we are — the week it all happens! Balticon! James Langton, you might recall, gave his voice to us for Harper Audio’s kicking production of Phoenix Rising: A Ministry of Peculiar Occurrences Novel. He’s back for The Janus Affair, and we could not be happier about it. Harper Audio gave us this preview for our podcast (you DO know about the steampunk podcast anthology Pip and I do, right? ), and after hearing it, Pip and I can’t wait to hear what James comes up with next! We are so stoked to have him bringing Wellington and Eliza to life, and hopefully we will hear him again when Book Three is green-lit for production. Hard to believe but this Balticon is my tenth — yes, tenth — as a professional author. It was this week in 2002 when MOREVI first arrived from Dragon Moon Press and days later I arrived to Balticon with one box of books and crossed fingers that I would sell half of the stock. I wound up selling out of books by Sunday. From werewolves of property to anti-zombie airship pilots, the Empire has struck back. Meet the writers of this Brave Old World. Speakers: A collection of incredibly talented people…and The Bruce. it.” Where do you find inspiration to make change in your life? How does that inspiration motivate you to get out and do, to write, to exercise, to improve your life? How can you be that inspiration for yourself, and for those around you? Join our discussion and share your thoughts on inspiration and its place in your work and your life. Three authors. One ingredient. Thirty minutes to write five hundred words, and YOU get to watch the thrilling action. Well, not THE action, that’s just in the story. But you get to watch the stories UNFOLD AS THEY ARE WRITTEN! Who will win the title? 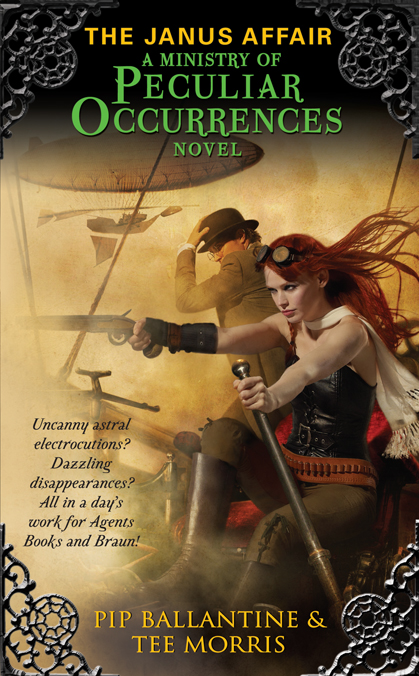 The Shared Desk Podcast, recorded live with steampunk tea and a special preview of The Janus Affair book trailer, all to launch The Janus Affair: A Ministry of Peculiar Occurrences Novel from Harper Voyager and Constellation Books. With the rise of ePublishing, Smashwords, and the independent publishing movement, there is commentary on blogs and in publications that the mainstream publishers are in trouble, and could very well be on the way out. However, some authors who have made a name for themselves in independent venues are making their first steps with houses such as Ace, Tor, and Orbit. Find out a different side of the debate, and why working with larger houses is still a goal for up and coming authors. Just What The Frak is Steampunk Anyway? This is where I’ll be this weekend, so please don’t be shy. Buy a book, shake my hand, meet some of the people around me; and have a blast with Pip and me as we celebrate the arrival of the next adventure of Wellington Books and Eliza D. Braun. When is the Book Launch the Second? I thoughti remembered that being a thing… Or was that only for SPWF? Either way, CAN’T WAIT TO SEE YOU GUYS AGAIN! And also: NEW MoPO SQUEE!!! Book Launch the Second is The Shared Desk LIVE Recording which is Sunday, 4 p.m.
We’re going to cram a lot in for one hour!